With killer dilemmas and murdering Klingons running rampant, having some form of protection for your personnel is a must for many players. 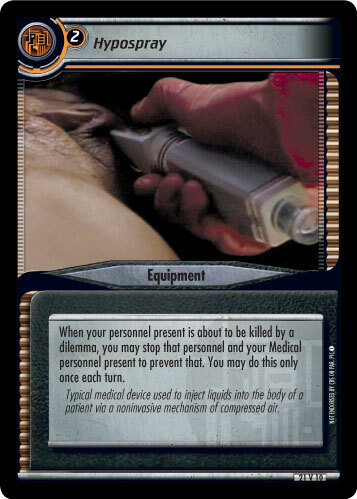 For a while now, the card of choice for many players has been Emergency Transport Unit (ETU). For the cost of returning the equipment to hand, you were able to prevent one personnel from being killed. Infinite Diversity introduces the Hypospray, an interesting twist on the popular ETU. For the same cost of two, you get a non-Hand Weapon equipment that provides the same basic effect (prevent a personnel from being killed). However, the Hypospray only works while facing a dilemma, so it cannot help you against assassins, like Trazko (Hired Muscle) or The Albino (Killer of Children), of if you find yourself in the heat of combat (e.g., All-Out War). Furthermore, the Hypospray does not work by itself, it requires a Medical personnel to use it, too, so instead of one kill you will end up with two stopped personnel instead. The downsides are made up for by the fact that the Hypospray does not have to be returned to hand when you use it (that means you cannot use it to trigger the abilty of Korath (Duplicitous Tinkerer) repeatedly, so Klingon players might prefer to stick to Emergency Transport Units). It simply stays in play, so compared to the ETU, you do not have to spend precious game resources like counters and Range on re-playing and picking up the equipment. Also, the Hypospray stays in the attempt and can help you pass dilemmas like Breaking the Ice and its counterpart We'll Never Know, two dilemmas especially popular in Virtual Format. Hypospray can be very useful in Draft formats. Although dilemmas that kill can be somewhat hard to find in draft, cards like Unknown Microorganism can provide a huge advantage for the lucky player who gets them. In draft environments, covering all skill bases is notoriously difficult, so even a handful of kills can potentially lock a player out of one or more missions. Infinite Diversity draft rules allow you to recycle your discard pile once per game, but it can take a long time until you are able to draw into a personnel with the needed skill again. Depending on the card pool, finding cards that can prevent personnel from being killed by dilemmas can be quite difficult: Escape is a rare card, Emergency Transport Unit is almost impossible to find in sealed packs these days... so the Hypospray that you will find in every Infinite Diversity draft set will give you a better shot at keeping your key personnel alive. There will even be a Medical personnel in the set who can actually use it, but it certainly won't hurt to draft at least another one.